Mary Ann Bastell has been specializing in Fairfield County residential real estate covering Westport, Weston, Wilton, Southport, Fairfield, Easton, Redding and Monroe. 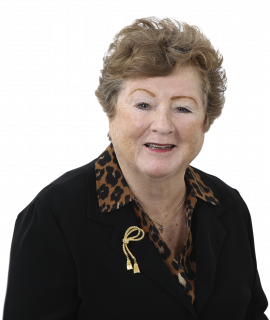 She is a native of Westport, has been a realtor for 30 + years and has seen many changes in Fairfield County. Mary Ann attributes her success to her quality of service, high energy, enthusiasm, expansive real estate knowledge, sound planning, persuasive skills, professional ethics, a strong company support system and loyalty to her clients. Keeping up with new trends and transitions in the real estate market is another key to her success. Her hobbies include golf, cooking, floral arranging and gardening. Mary Ann’s real estate affiliations include membership in the national, state and local Board of Realtors, as well as a member of CRS, Certified Residential Specialists. She is a long standing past member of the Fairfield County Home Builders Association and a long time affiliate of the Westport Chamber of Commerce. In addition, William Pitt Sotheby’s International Realty has a Relocation service, which refers relocated transferees to member realtors throughout the United States and abroad. Experience you can trust says it all about Mary Ann.